NALP's reporting on the presence of women and minorities in large firms now spans 25 years. Findings have been reported out year by year over that time period, but summary findings are presented here all together for the first time. These tables largely speak for themselves, but a few highlights are noted below. Most of the growth in minority representation in the associate ranks is accounted for by Asians and to a much lesser extent, Hispanics. At over 11% of all associates, Asians account for over half of minority associates; moreover, their share has increased every year. In contrast, growth in the share of African-American/Blacks among associates has been virtually non-existent, and peaked in 2008. This was followed by a seven-year decline. 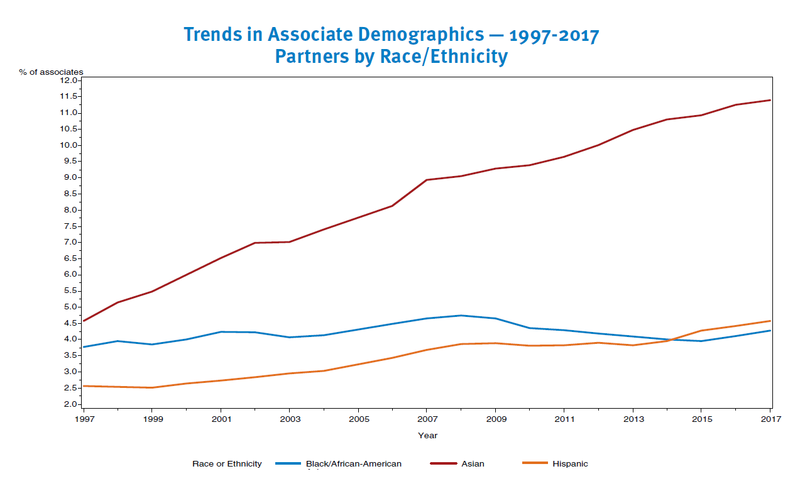 Among partners, interestingly, prior to 2005 African-American/Blacks had the largest minority representation among partners, albeit, at just over 1% of partners, a tiny one. 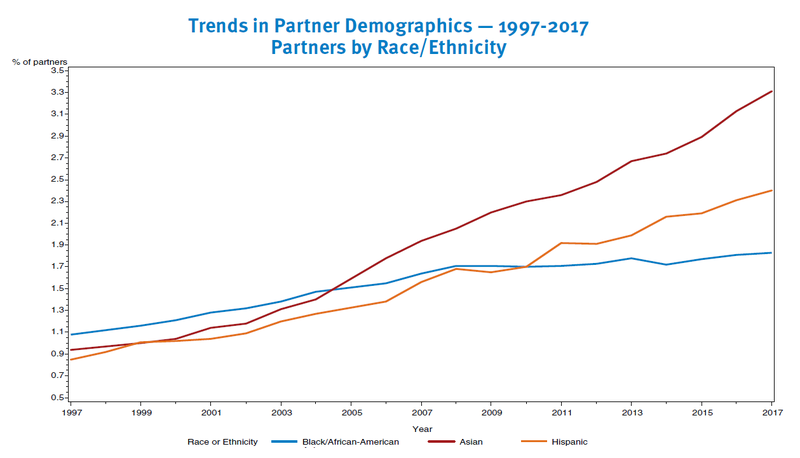 Things began to change in the mid-2000's, at which point growth in the share of partners who are African-American/Black essentially stalled out, while the share of partners who are Asian or Hispanic kept increasing. Just over 8% of partners were minorities in 2017, and less than 3% were minority women. Finally, figures for all lawyers have been compiled since 2006. The decline in minority representation among associates that occurred in 2010 is also reflected in the figures for all attorneys. The percentage of minority women among all attorneys was essentially unchanged over a four-year period from 2009 to 2012. NALP press releases and research NALP Bulletin columns from which these summary findings were compiled can be found on the NALP website at www.nalp.org/pastpressreleases and www.nalp.org/minoritieswomen. *An asterisk indicates that the partner figures include of counsel, or that the associate figure includes senior attorneys, and staff attorneys. Source: Figures compiled from NALP's Directory of Legal Employers for the years 1993-2017. Source: Figures compiled from NALP's Directory of Legal Employers for all the years 1997-2017, except 2005. Note: Starting in 2006, data collection was expanded to include gender within each racial/ethnic category. Figures for all lawyers were calculated starting in 2006. Source: Figures compiled from NALP's Directory of Legal Employers for the years 2006-2017.